This book was sent to me for free. This book was sent to me by the publisher. I was sent this book in exchange for an honest review. Synopsis: See no evil, hear no evil, speak no evil ... do no evil. For over five years, the fourth monkey killer has terrorised the residents of Chicago. When his body is found, the police quickly realise he was on his way to deliver one final message, one which proves he has taken another victim who may still be alive. As the lead investigator Detective Sam Porter knows even in death, the killer is far from finished. When he discovers a personal diary in the jacket pocket of the body, Porter finds himself caught up in the mind of a psychopath, unravelling a twisted history in hopes of finding one last girl, all while struggling with personal demons of his own. With only a handful of clues, the elusive killer's identity remains a mystery. 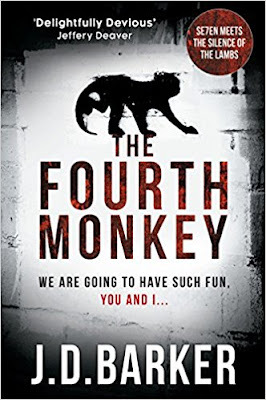 Time is running out and the fourth monkey killer taunts from beyond the grave in this masterfully written fast-paced thriller. Review: Before I get into the review I would like to thank the publisher for sending me a copy of this book. It excites me that this book is described as "Se7en meets silence of the lambs" as those are two movies that I really enjoy. When it comes to thriller books and movies I have a pretty dark taste. This was a truly amazing book and with each turn of the page I became more and more lost in this book. This book is extremely exciting and action filled to the point that you will be on the edge of your seat wondering what is going to happen next. The addition of the diary entries makes for good insight into the killer's life, childhood and why he is like he is. This is the kind of book that grips the attention of the reader and holds it hostage until the end of the book. In my opinion this is the kind of book that would be perfect in the book collection of anyone who enjoys crime fiction and thriller novels. I firmly believe that this book would make an amazing movie adaptation so long as they didn't remove too many of the details from the book. I would highly recommend this book to any avid reader who enjoys mystery thrillers but I also suggest that other readers venture into the book as I am sure that as long as you don't mind gory details that you will fall deeply in love with this book. It is the kind of book that once you start reading you can't stop reading and put the book down. The ending of this book is a major cliff hanger so I am ready to have the next book and find out more about the story line. I enjoyed this book so much that I pre-ordered the next book for me and my sister as soon as it became available on Amazon. I gave this book a five star rating as it was just an epic read and left me hooked. I can't wait to get my hands on the second book as I am sure that it will be as amazing as the first.